The people have spoken and Meghan was princess perfection! Princess Diana's memory was always going to shine bright at her youngest son Prince Harry's wedding to Meghan Markle. But no one expected that her legacy would get a chance to glitter in such a poignant and significant way. For the newlyweds second wedding reception, Meghan Markle was dressed in a custom silk "lily white" Stella McCartney evening dress. And placed on her right ring finger was a dazzling aquamarine ring, which has been confirmed to be one Princess Diana's favourite pieces. And our little eye spots some VERY splash bling! Diana played an instrumental role on her son's big day. We saw the new Duchess of Sussex wear one of Harry's mum's iconic jewels. Meghan represented her "something blue" through the iconic Diana piece in the most elegant way. 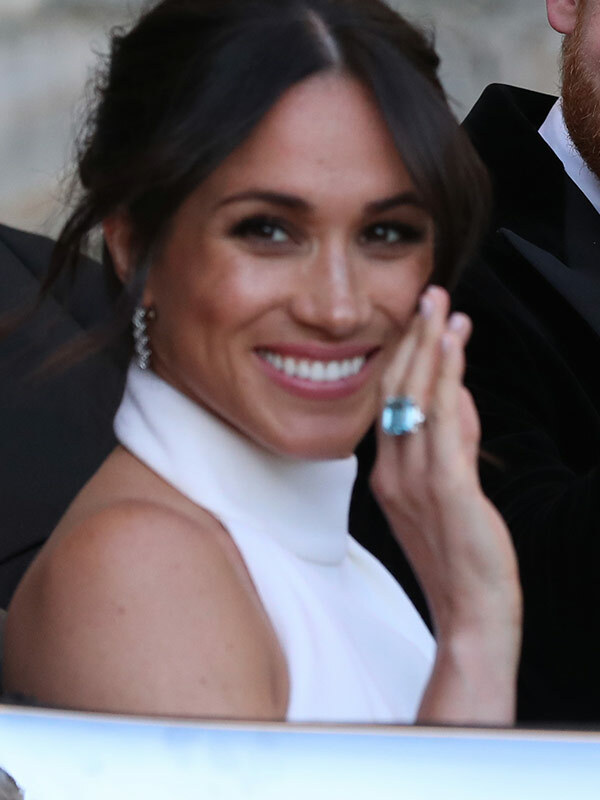 The new Duchess of Sussex received the beautiful ring from her husband, the new Duke of Sussex, to celebrate their new adventure. It's not the first time Princess Diana has played a role in the jewels Prince Harry has given to Meghan. The star's engagement ring features two diamonds from Prince Harry's mother's collection. Meghan's second dress was Stella McCartney creation. How dashing is Prince Harry. Harry is ready to whisk his Mrs away. Harry would have no doubt shared with his wife the significance of the piece. Princess Diana famously wore the ring back in 1997, when she attended the Christies auction of her memorable outfits back in 1997. But astute royalists will know that she actually debuted the stunner in Australia back in October 1996 at the Sydney Entertainment Centre where she went to the Victor Chang Cardiac Research Institute Dinner Dance. The ring is part of a set, which is accompanied by a pearl bracelet with a matching aquamarine stone placed in the centre. The couple also paid tribute to the People's Princess with Diana's sister giving a reading during the ceremony and Meghan's bouquet were filled with the late royal's favourite flowers forget-me-knots. She donned the jewel in Sydney! The ring became iconic when Princess Diana showcased the sparkler at her Christies auction. Meghan, 36, decided to shine focus on the ring, keeping her wrists bare. Other than Diana's and her wedding ring, the former actress was very minimal with her jewelry choices adding a pair of drop diamond earrings. Kensington Palace released a statement about Meghan's second look. Meanwhile, the dashing groom looked so Hollywood! Prince Harry opted for a tux and it's safe to say we're swooning over the couple! Be sure to get the special edition of Woman's Day on sale Monday- relive the magical day with 16 pages of the most precious moments from Harry and Meghan's wedding. Plus look out for our dedicated souvenir issue on sale nationally on Thursday with the complete picture album!